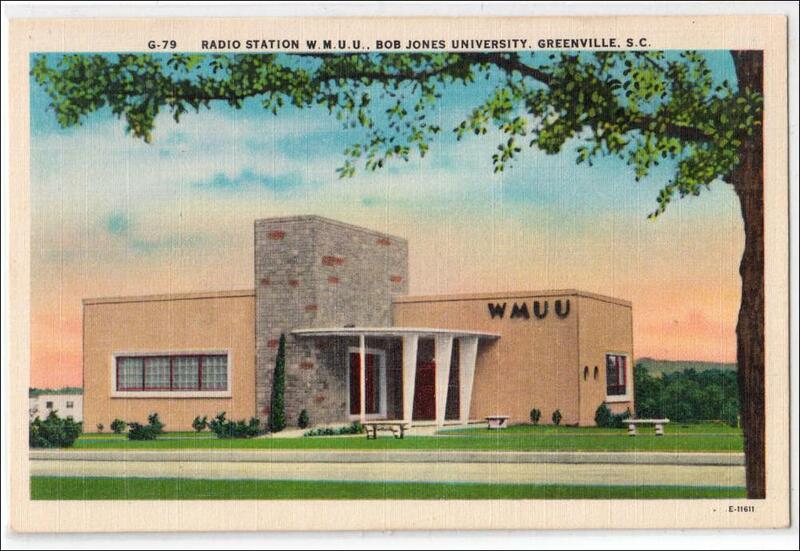 On April 17, 1960—Easter Sunday—Bob Jones Sr. gave a radio address entitled “Is Segregation Scriptural?” on station WMUU AM 1260 (the call letters stood for World’s Most Unusual University). 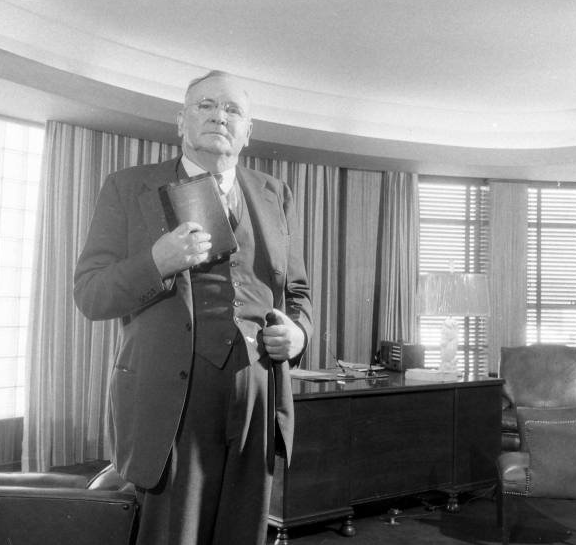 The address, probably about 45 minutes in length, was broadcast early in the morning for residents of Greenville, South Carolina (and beyond), who were listening while preparing for the Sunday morning service at their local church. Before looking at the address itself, some context will set the stage. 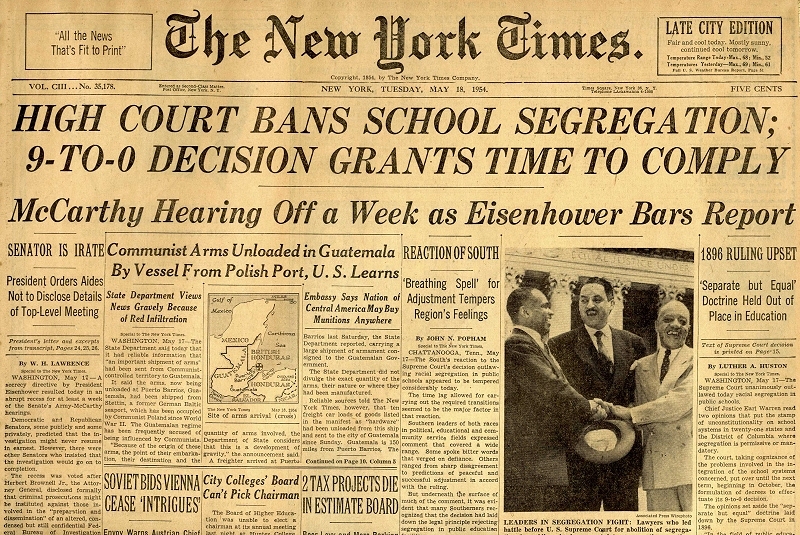 Six years earlier, in May 1954, the U.S. Supreme Court issued its unanimous ruling in Brown v. Board of Education of Topeka, concluding that “in the field of public education the doctrine of ‘separate but equal’ [from Plessy v. Ferguson (1896)] has no place.” The court, led by the new Chief Justice Earl Warren, declared that “Separate educational facilities are inherently unequal,” which meant that racial integration of public schools was mandatory (even if many school districts dragged their feet instead of proceeding “with all deliberate speed“). This did not apply to a private Christian institution of higher education like Bob Jones College, which Bob Jones Sr. founded at St. Andrews Bay, Florida (1926–1933), before moving the school to Cleveland, Tennessee (1933–1947), and then to Greenville, South Carolina (1947–present), where it became Bob Jones University under the presidency of Bob Jones Jr.
No African American students were permitted to enroll at Bob Jones University. 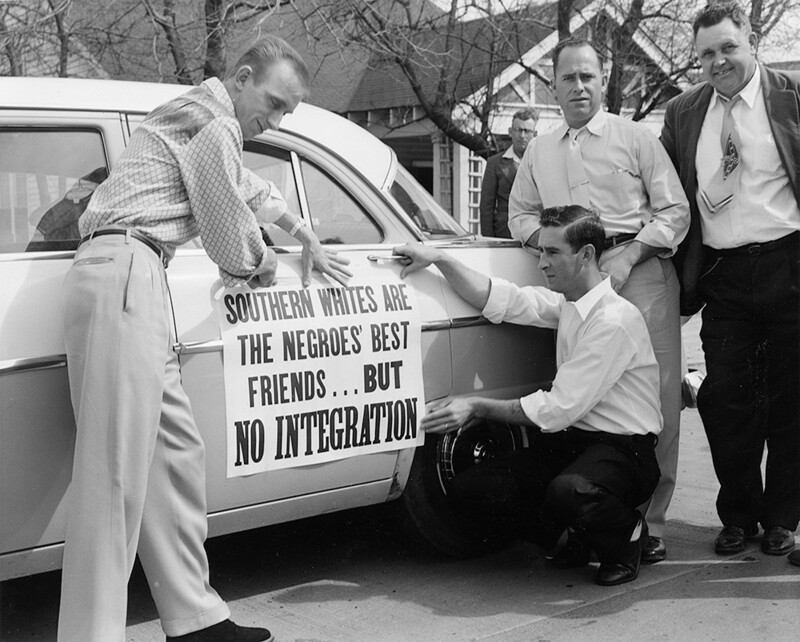 White Southerners felt threatened by the disruption and undermining of their laws and social order by these racial agitators. 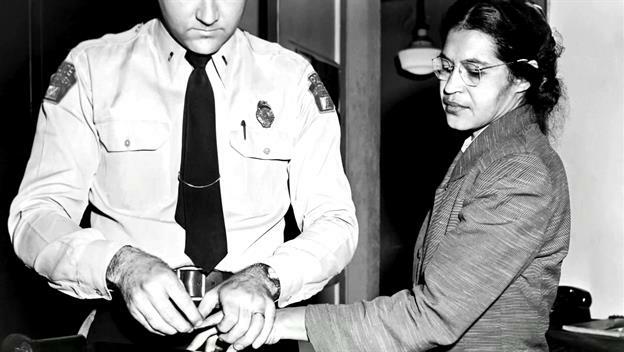 On December 1, 1955, Rosa Parks was arrested for failing to obey the orders of a Montgomery bus driver to move to the back of the bus, setting off a yearlong bus boycott led by the 27-year-old Baptist minister, Martin Luther King Jr. 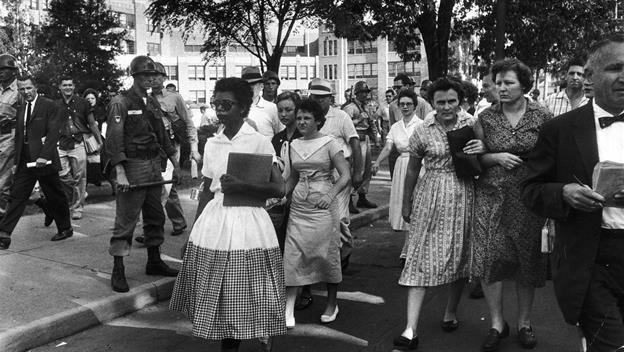 In September 1957, the governor of Arkansas blocked nine black students from entering the previously all-white Central High School in Little Rock, until the federal government stepped in to enforce the integration. 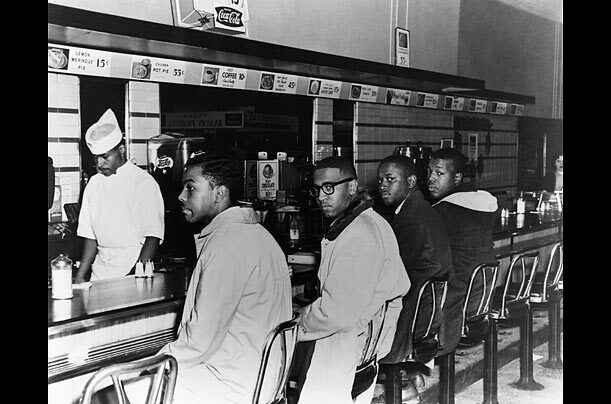 On February 1, 1960, four black students from North Carolina A&T College were refused service at a segregated F. W. Woolworth lunch counter in Greensboro, and the college students staged a sit-in, refusing to vacate their seats. Within weeks, there were sit-in campaigns across the South at other Woolworth and Kress department stores, most notably in Nashville, where the sit-ins lasted for nearly three months. 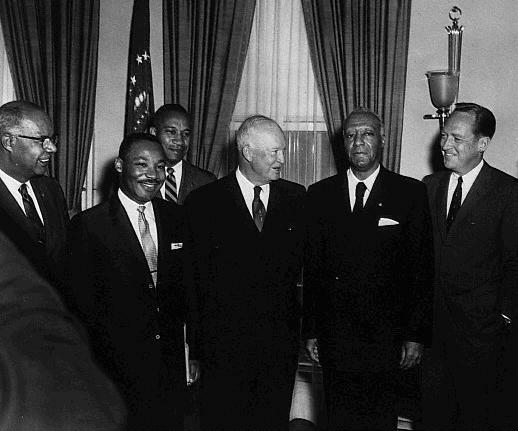 The Civil Rights Bill of 1960 was also making its way through Congress. After adding some amendments, the Senate approved the House bill on April 8. Two weeks later, the House approved the Senate amendments, and then President Eisenhower signed it into law on May 6. But perhaps it was the racial turmoil hitting closer to home in Greenville that led Jones to speak out. In October 1959, the African-American baseball star Jackie Robinson—who had retired a few years earlier from the Dodgers and was in town to speak at an NAACP state conference—was threatened with arrest when he refused to vacate the white waiting room at the Greenville airport, sparking a protest march on January 1, 1960, from Springfield Baptist Church to the airport. Then there were the actions of another, more popular, Southern evangelist: Billy Graham. Graham was a former student at Bob Jones College who transferred to another fundamentalist school after one semester. As Graham’s stardom and fame increased and as he distanced himself from separatistic fundamentalism (allowing modernists to play a role in his crusades), the tensions between Graham and Jones increased. In the spring of 1953, at a crusade in Chattanooga, Tennessee, Graham personally removed the ropes separating the black section and the white section, declaring that he would not preach in a segregated crusade. In 1957, he invited Martin Luther King to pray at his Madison Garden crusade in New York City. 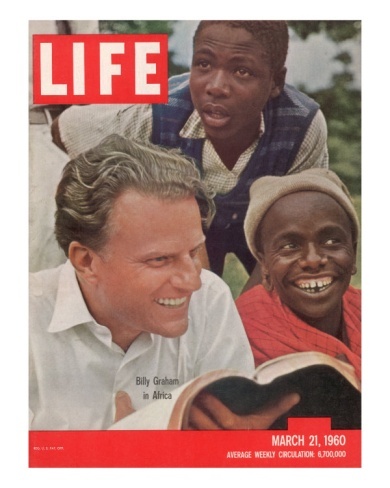 On April 7, 1960, Billy Graham (then 41 years old) returned from a ten-day trip to Africa, criticizing the segregation of white evangelicals in the United States. The whole trend of Scriptural teaching is toward racial understanding. Many use the Scriptures that were applied to Israel. It is true that God called Israel to be unique among the nations and told them to separate themselves from the evil nations round about them. But the white race cannot possibly claim to be the chosen race nor can the white race take for themselves promises that were applied to ancient Israel. . . . Jim Crow must go. It is absolutely ridiculous to refuse food or a night’s lodging to a man on the basis of skin color. . . . Modern communications and travel have made the entire world a neighborhood. Who is our neighbor? Jesus gave us the answer in the parable of the Good Samaritan, and yet the Samaritan showed who his neighbor was by helping a person of another race. . . . The message of Christ has led to many great social revolutions and upheavals in history. We are certainly living in one of those crucial periods of social change at the moment, largely caused by the penetration of the teaching of the Scriptures. These periods of history are not easy nor can this type of social change take place over night. Great love, understanding and patience must be exercised by all. Graham’s statement made the front page of the local Greenville Piedmont afternoon newspaper. Two days later, the 76-year-old Jones—who was born five years after the completion of Reconstruction and who was the son of a Confederate soldier—took to the airwaves on Easter Sunday to make his case from Scripture about why all of this racial change from outsiders was not something to be welcomed and celebrated but rather to be rejected and condemned. After the address aired, Jones had the talk transcribed and printed as a booklet, which became the school’s primary statement on race and integration throughout the 1960s and 1970s, and into the 1980s. The pamphlet was also sold in their campus bookstore and sent to donors and inquirers. In 1971, three years after the death of Bob Jones Sr., the school began admitting black students—but only on the condition that they were already married, and married to someone of the same race. In 1976, the school opened its doors to all Christian black students, but also strengthened their prohibitions on interracial dating and marriage. One of the most significant reasons for segregation was that if blacks and whites swam together and ate together and went to school together, they would eventually date and marry each other, mixing the two races. In the spring of 2000, Bob Jones III told Larry King that the school was dropping its ban on interracial dating. 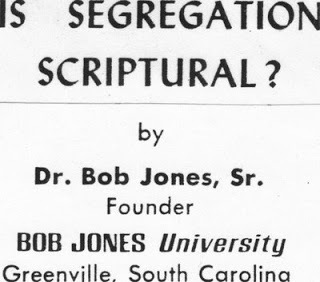 Bob Jones University no longer teaches or distributes Bob Jones’s 1960 defense of segregation, and should be given credit for publicly repudiating its position. I have reprinted it below in its entirety, despite some repetitiveness, so that you can read his full case without abridgment. Nevertheless, this is an important historical document that helps us get inside the mind of a segregationist who was absolutely convinced that he was doing and expressing God’s will in contrast to those who were undermining God’s created order for society and for sexuality in particular. One of the values of carefully reading a document like this is that it prevents us from constructing straw men, which are counterproductive in argumentation and in understanding the past. For example, if you said that Bob Jones claimed that whites are superior to blacks, or that whites and blacks should not fellowship together, or that slavery was biblically permissible—then he would rightly complain that you have misrepresented his words. Or if your definition of racism requires an explicit affirmation of racial superiority or inferiority, and if you think that Bob Jones was a racist, then you would have to show how his words entail such a position even as he explicitly denies it. We never go wrong, and we always strengthen our case, when we accurately represent those without whom we disagree. I have added headings in bold type, seeking to provide guideposts for your reading.